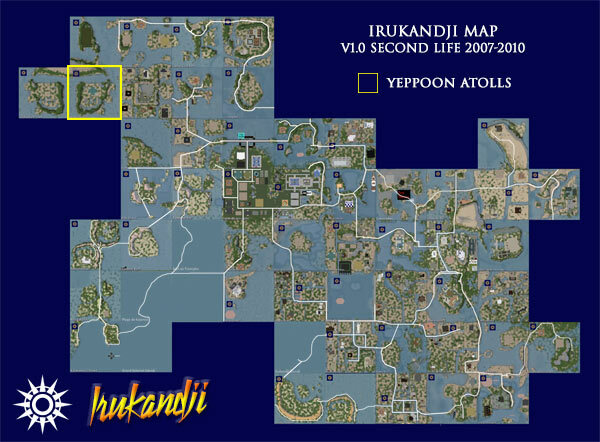 Located in the far northwest of Irukandji, the light-residential region of Yeppoon Atolls forms part of Jillaroo State. While not immediately evident, the landscaping for Yeppoon Atolls actually draws heavily upon Grand Irukandji, with large canals to the east and north, overshadowed by a tall steep mountain. Clockwise from west, Yeppoon Atolls adjoined the sims, Great Keppel Island, Tuvalu Straits, Barramundi Bay, Jackaroo Island, and Mantaray Shoals. A single landholder leased most of the island during its lifetime until it was decommissioned in late 2008. The simulator, Yeppoon Atolls, takes its name from the seaside town of Yeppoon in Queensland AU where I spent part of my childhood and still visit regularly. Due to hard-drive issues of the era, all photographs of Yeppoon Atolls have been lost. If you visited the region and took photos, please let me know in the comments below.